Laser ablation is a method of wire stripping where enamel coatings can be removed from precise locations with non-mechanical means. The process involves use of laser energy to ablate precise layers of enamel without causing damage to the metallic conductor. The energy is in the form of light waves that are absorbed by the polymer coating, typically a relatively thin layer of polyimide, causing the atoms to be ripped from the wire surface. At the same time light is reflected from the conductor generating very little heat and a “cold” vaporization of the insulation. For small diameter wires UV laser technology uses short wavelength ultraviolet light coupled with nanosecond duration pulses, enabling instant vaporization leaving a clean metallic surface for terminating. 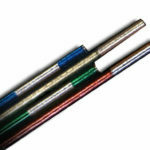 Enamels may be stripped into small “windows” at precise lengths in a reel to reel process that allows for continuous length of wire delivered on spools for further processing. Advances in the development of interconnects in the medical device market have resulted in novel ribbon cable assemblies where laser ablating can speed up and simplify the process of making connections of the cable. When stripping a wire, it is necessary to cut right around the wire circumference. This is usually achieved by making a cut from opposite sides. 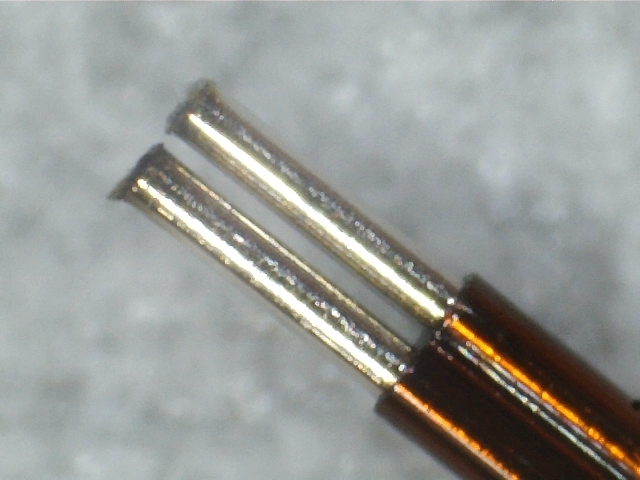 For very thick wires it may be necessary to cut right around the circumference by spinning the wire or the laser beam – but for thinner wires (<5 mm / 0.2″ diameter) – it is enough to cut from two sides and have the two cuts join together. For example, see the diagram below.